Japanese Episode DP 019: "I'm Gonna Get this Pachirisu...Is That OK!?" American Episode 483: "Twice Smitten, Once Shy!" Out in a grassy field, Hikari sets her sights on a new pokemon - Pachirisu! After a few brief skirmishes, Hikari is able to weaken the pokemon enough to capture it! However, the electric pokemon proves to be too excitable for the young Coordinator as it starts a chase that ends in everyone getting electrocuted! After the mayhem calms down, Hikari starts to doubt her ability to train the young pokemon. She finally decides to release Pachirisu, so she lets it go and watches it run into the woods. After Hikari tells Satoshi and Takeshi what she had done, the two trainers convince her not to give up and to try raising it again. Hikari is eventually convinced and decides to re-capture Pachirisu, but when she catches up with the pokemon, she sees that Musashi of the Rocket-Dan is trying to catch it! After trying a number of legit ways to capture the pokemon, Musashi-tachi resort to their old stash of gadgets to get the job done. After immobilizing our heroes in a glue-like substance, the trio flies off with Pachirisu, but their flight is cut short when the electric pokemon unleashes a powerful electric attack. With the Rocket-Dan gone, Pachirisu runs up to Hikari and decides to go with her of its own volition. Now that Pachirisu has calmed down a bit, Hikari is confident that the squirrel pokemon will help her win her first Contest Ribbon in Sono'o Town. As far as capture episodes goes, this one stands out. It's not often we see a heroine give up a pokemon moments after she's caught it, and I think the fact that Hikari did so shows a lot about where she's at as a trainer. She may act strong and confident, but it's really nice to see moments of weakness like this as well. It's a storyline that can only work with a newbie like her, and I'm glad the anime decided to do this with Hikari and Pachirisu. The dubbed version can't seem to decide how they want to pronounce Pachirisu's name. The two pronunciations we get are Patchy-REE-soo and Pah-chee-REE-soo, and no one is consistent with the way they say the name. In one sentence, a character will say Patchy-REE-soo. Then, the same character will say Pah-chee-REE-soo a couple of sentences later. You'd think someone at PUSA would pay a little more attention to these kinds of things, but I guess it slipped by them somehow. (For the record, the correct pronunciation is Pah-chee-ree-soo without the emphasis placed on the REE part of the name). Another issue with the dub is that they only keep three pieces of Japanese music in the episode. Ouch. Pachirisu keeps its Japanese voice. The ending theme By Your Side ~Hikari's Theme~ is played from the time Hikari first lets Pachirisu out of its Monster Ball until all her pokemon trip and fall. In the dub, this is all replaced by a new-sounding instrumental song that will probably get recycled over and over for the next few years. The scene where Hikari lets Pachirisu go is a lot different depending on what version you watch. In the Japanese version, Hikari sounds really down about letting her new friend go. Toyoguchi Megumi speaks all of her lines a bit more quietly than she normally does, and the fake cheeriness she puts into the voice is exactly what you'd expect Hikari to do to keep from crying. All of this is accompanied by the slow version of the ending theme which dub fans will remember from the ribbon scene in "Mounting A Coordinator Assault!" (or, from later in this very episode). In the dub version, the voice actress sounds like she's merely reading her lines off a page. Well, she is, but so is the Japanese VA. An effort is put forth to make Dawn sound "sad," but she sounds less like she's parting with a friend and more like she just dropped her ice cream cone on the ground. The horrid sounding crying as she's running away (which isn't in the Japanese version at all) doesn't help matters, either. And while the music played in the American version is taken from PUSA's stock of "sad" music, it's nowhere near as powerful as the quiet, melancholy song used in the original. People give Sarah Natochenny a hard time for not having enough emotion (the least of her worries, in my opinion), yet they ignore scenes like this. I don't understand it. This just goes to show how much music and voice acting can really change a scene. If PUSA would just leave the Japanese music alone, half their problems would be solved right there. They'd still have the voice cast to deal with, but at least their scenes wouldn't be completely ruined the way it is here. Meowth: "Hey, it's good to stay in one place!" Jessie: "But let's not forget, we have other plans for Pachirisu." Meowth: "One spritz of Team Rocket Perfume and it's a done deal." James: "Say, I didn't know you were well-versed in aroma therapy." Meowth: "O' course! Don't raise a stink!" Originally, that spray Nyasu holds up is to get rid of the gunk with which Pachirisu (and our heroes) are stuck to the ground. We see Nyasu spritz Pachirisu's foot with the spray, freeing it. 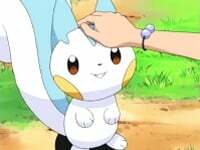 Later, we see Pachirisu give the spray to Hikari so she can free herself and her friends. I don't know where the dub got "perfume" from since changing the anti-gunk spray into perfume means the dub is left without an explanation as to how everyone got free from the Rocket-Dan's glue. I guess they wanted to offer an explanation for why Pachirisu took to the Rocket-Dan so easily (saying it was under the spell of the perfume or something), but I think it's pretty obvious that it was only pretending to like Musashi so it could get close enough to their balloon to blow it up. The TO BE CONTINUED screen was three seconds longer in the dub than it is in the Japanese version. What? You were expecting this to be in a different language or something?